1.) 1kg (2 lbs) grass-fed beef flank steak (skirt steak in Australia). 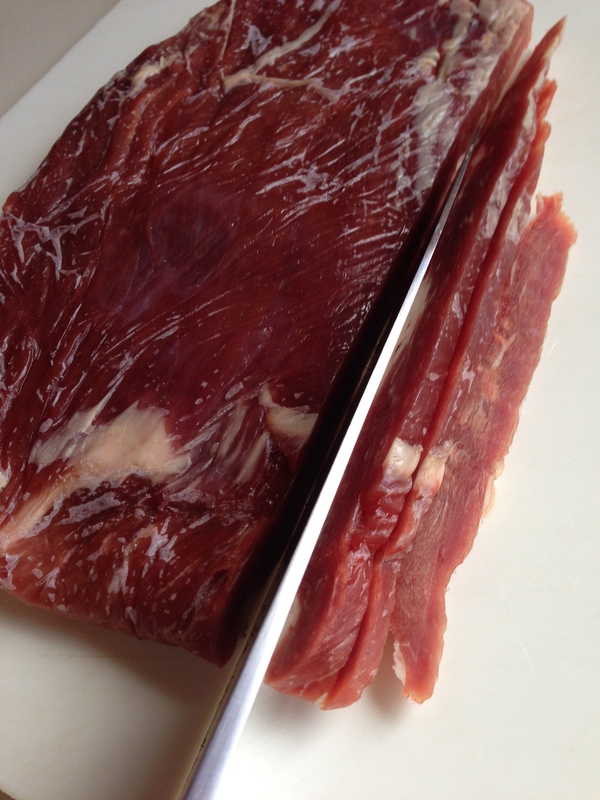 For ease of slicing, partially freeze the meat. 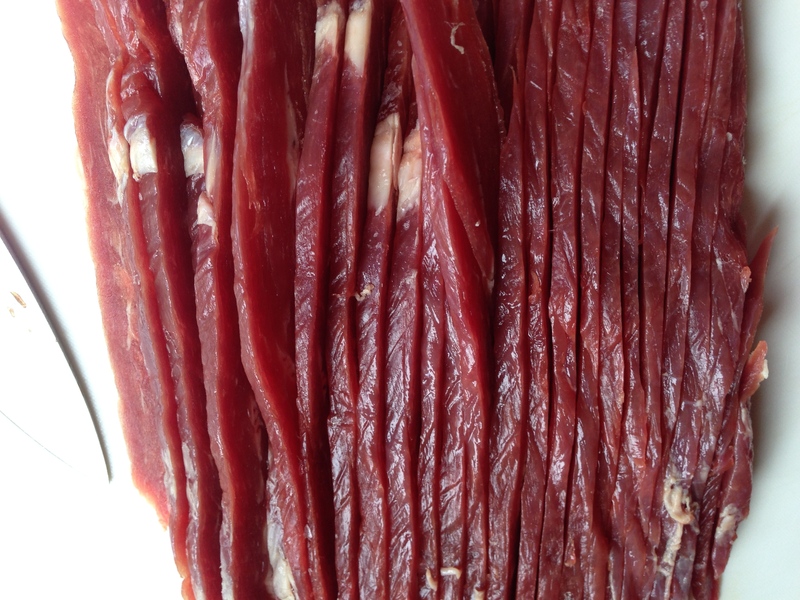 Wrap each steak, one layer thick, in cling film and place in a flat position in the freezer for about 2.5 hours. It will seem rather solid on the edge but the middle will still be slightly soft and it will thaw a bit as you cut. Slice in 1/8 inch (3mm) thick pieces WITH the grain of the meat. Slice pieces as evenly as possible so they dry evenly. 3.) 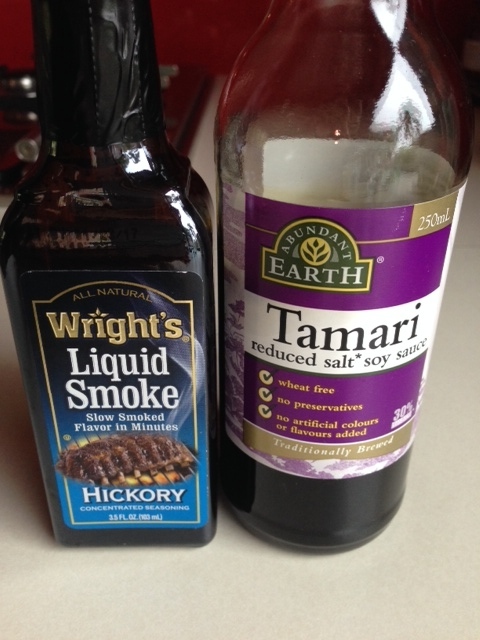 Make sure each strip is separated and massage the marinade around so that each piece gets coated. Let sit in the fridge 24 hours, turning and massaging the bag a couple of times to ensure even marinating. 4.) Place the strips close together but not quite touching, on racks over baking pans to catch the drips (I like to line the pans with foil to help with cleanup). Sprinkle lightly* with garlic powder, good quality sea salt or Himalayan salt, and freshly cracked pepper (to taste) and bake in the oven @ 175 – 200 F (100 C). 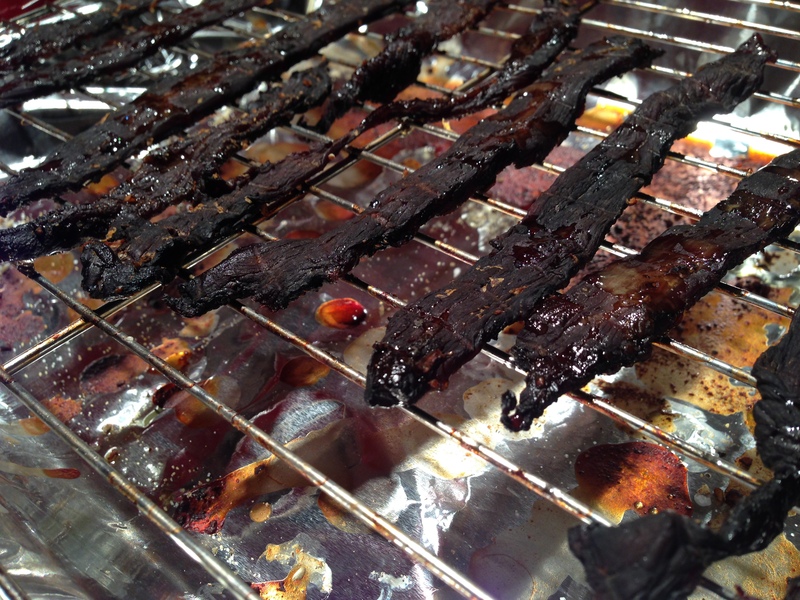 Check after 1 hour and remove any tiny strips that may be dried early, so they don’t turn crispy. 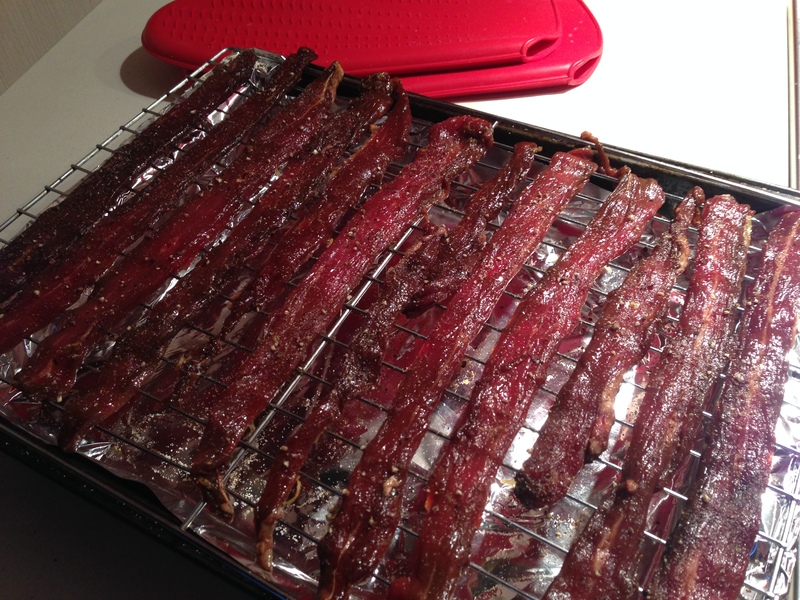 Also, I like to turn the strips over so they dry more evenly. Most of them will probably be done between 1.5 and 2 hours, unless you have cut them thicker in which case they will take more time. Don’t let it get too dry and crispy, you want it ‘chewy’. 5.) Cool completely and put into zip loc bags or a jar and store in the fridge. This recipe makes about four pans worth of strips when cut to this width. *As the moisture evaporates from the strips, the flavours will concentrate, so go lightly with the garlic powder, salt and pepper until you have baked your first pan and can see how you like the strength of flavours. You can always add more to the remainder of the batch. Make notes on the recipe so that next time you make it you remember how much you used. For an entire batch I use only about 1.5 tsp Himalayan salt as I find it very intense, but we like the heat from pepper so I use probably 3-4 tsp of freshly cracked black pepper. 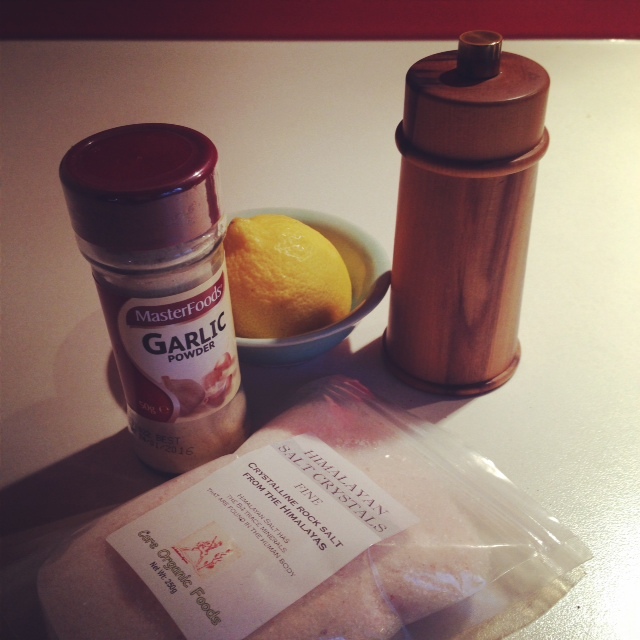 With the garlic powder I use just a very light sprinkling so that we don’t all go around smelling of garlic fumes!